LOS ANGELES (Ticker) - German Tommy Haas wasted a pair of chances to defeat top-seeded American Andre Agassi in the second set of their quarterfinal encounter at the $380,000 Mercedes-Benz Cup on Friday night. He did not make the same mistake in the third. Haas blew two match points in the second set but nevertheless upset Agassi, 7-6 (7-5), 6-7 (6-8), 6-3, to reach the semifinals of the hardcourt event. 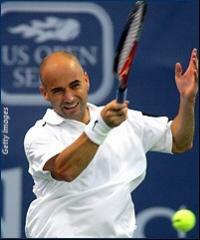 Haas held a 6-4 lead in the second-set tiebreak before Agassi won the next four points to even the match. But Haas kept his composure, broke Agassi in the sixth game of the third set and held serve thereafter to close out the contest. Haas, who had lost just nine games in his first two matches, will take on unseeded Frenchman Cyril Saulnier in the semifinals. Saulnier upset third seed Mardy Fish of the U.S., 7-6 (8-6), 7-6 (9-7). American wild card Jeff Morrison was more successful than Fish, dispatching Wesley Moodie of South Africa, 6-3, 6-4. He will meet Nicolas Kiefer in the semifinals after the German beat Brit Greg Rusedski, 6-1, 6-4. First prize is $52,000.